Surgical vs Endoscopic Treatment of T1 Esophageal Adenocarcinoma? Endoscopic therapy of T1a esophageal adenocarcinoma (EAC) yields more quality-adjusted life years (QALYs) and is more cost effective than esophagectomy, shows a Markov model analysis published in the March issue of Clinical Gastroenterology and Hepatology. However, therapy for T1b EAC should be selected based on patients’ age and comorbidities. Two-way sensitivity analyses of T1a EAC following esophagectomy or endoscopic therapy state utilities with respect to (A) QALYs and (B) cost-effectiveness; T1b EAC age at diagnosis and Charlson comorbidity index with respect to (C) QALYs and (D) cost-effectiveness. Although EAC has been most commonly treated by esophagectomy, treatment for localized disease is moving toward an endoscopic approach. Guidelines for treatment of EAC confined to the mucosa recommend endoscopic therapy over esophagectomy because of comparable efficacy and decreased morbidity. In contrast, esophagectomy is recommended for EACs that have invaded the submucosa (T1b). Patients with T1b EAC receiving endoscopic therapy were reported to have worse outcomes than patients who received esophagectomy, yet endoscopic therapy is increasing. For patients with already reduced life expectancy from comorbidities, it is unclear whether the relative gain in cancer-related survival with esophagectomy is worth the cost in quality of life with esophagectomy. 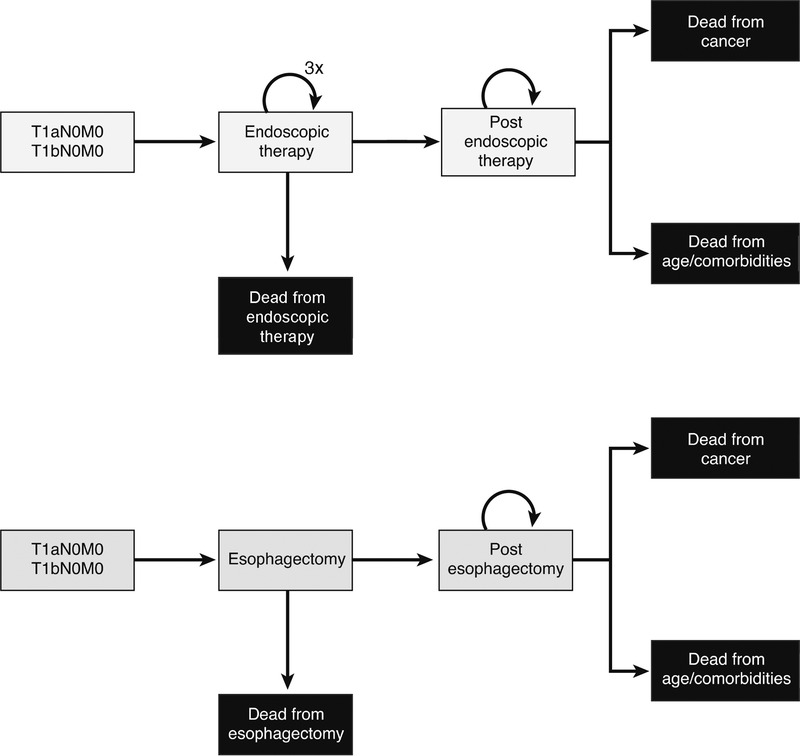 Jacqueline N. Chu et al therefore developed a decision-analytic model to investigate the effectiveness of esophagectomy vs endoscopic therapy for patients with T1a and T1b EACs, with respect to unadjusted life years, QALYs, and cost-effectiveness. “We wondered what patients factors, particularly age and comorbidities, might change the optimal therapy for early-stage esophageal cancer from esophagectomy to endoscopic therapy,” Chu explains in a video abstract. Model parameters were estimated from published reports. In the model’s analysis of EAC T1a, esophagectomy yielded 0.16 more unadjusted life years than endoscopic therapy, but returned 0.27 fewer QALYs and cost $34,834 more. The endoscopic therapy strategy would therefore be preferrred over esophagectomy for patients with T1a EAC (more QALYs and cost less). For the T1b analysis, esophagectomy yielded 0.72 more unadjusted life years and 0.22 more QALYs than endoscopic therapy. However, esophagectomy was not cost-effective, with an incremental cost-effectiveness ratio of $156,981/QALY. Sensitivity analysis found endoscopic therapy to optimize QALYs for patients with T1b EAC who were more than 80 years old who had a comorbidity index of 1 or 2, or if the ratio of post-esophagectomy to post-endoscopic therapy utilities was below 0.875 (see figure). 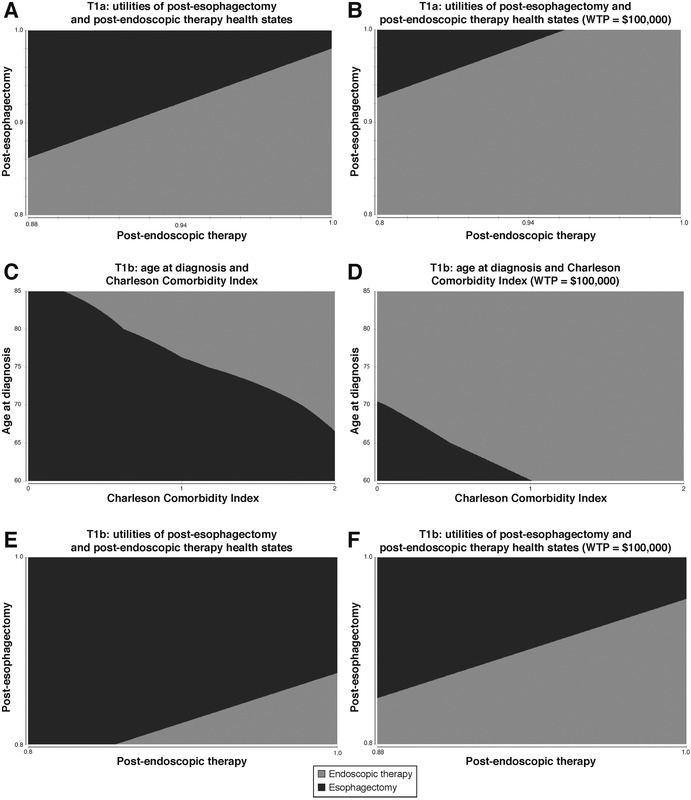 “As the combination of age and comorbidity index increases, the preferred strategy moves from esophagectomy [black in panel C of figure] to endoscopic therapy [gray]’, Chu explains in the video abstract. Chu et al conclude that that endoscopic therapy is optimal for patients with T1a EAC, regardless of age or comorbidities, providing more QALYs and at a lower cost than esophagectomy. Although esophagectomy yields slightly more unadjusted life years than endoscopic therapy, Chu et al believe that with QALYs as the end point, the results were only sensitive to relative utilities of the post-esophagectomy and post-endoscopic health states at a ratio of 0.97. So, if patients considered their quality of life after esophagectomy to be nearly nearly equal to, or preferable to, their quality of life after endoscopic therapy, esophagectomy would be the optimal treatment strategy. An example would be the patient who would rather have an esophagectomy than worry about recurrence with endoscopic therapy. For T1b EAC, selection of the optimal treatment strategy is based on the combination of age at diagnosis and Charlson comorbidity index score, and again on relative utilities of post-treatment health states. For younger patients (60–70 years old), esophagectomy is the preferred strategy at all comorbidity indices. However, for patients older than 70 years, with increasing comorbidity index scores, the optimal strategy changes to endoscopic therapy. For the sickest patients, 80 years and older with comorbidity index of 2, endoscopic therapy provides not only more QALYs but more unadjusted life years as well. The relative utilities of post-esophagectomy and post-endoscopic health states are key in selection of the optimal treatment strategy, reflecting the importance of patients’ perspectives on quality of life after esophagectomy. With regard to cost-effectiveness, esophagectomy was only cost-effective for younger, healthier patients (ages 60–70) with comorbidity index scores of 0–1. “For patients with T1B EAC, the decision to treat with esophagectomy vs endoscopic therapy should be individualized, factoring in the patients’ age, comorbidities, and quality of life preferances,” concludes Chu in the video. Does Drinking Coffee Increase Survival of Patients With Colorectal Cancer? Review: How Does the Tumor Stroma Contribute to Pancreatic Cancer Progression, and Can We Stop It?